This print of the Whale Bone Macaroni (c1772) shows us a Staymaker making a delivery of a pair of stays. This is one of series of prints spoofing the "Macaroni" fashion being followed by tradesmen. He certainly looks more dashing than one would expect a hardworking tradesman to dress. 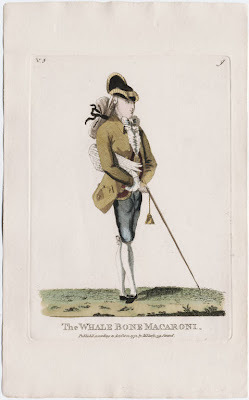 The Lewis Walpole Digital Library has a number of these prints online, follow the links to see addtional tradesmen dressed in the exaggerated continental style known as Macaroni. I am interested in Macaroni fashion and would like to exchange ideas.